When we were given a call by the team in Modenas about the launch and their announcement on the new Modenas CT115S, it brought us back down memory lane; where the birth of Malaysian Riders officially into the world of Malaysian motorcycle industry. We were certainly happy to hear that our national motorcycle manufacturer will be releasing a brand new bike into the market after a long hiatus from them. Anyway, let’s give a quick look to the new Modenas CT115S before we start with our opinion on the bike after a day of test session on Elite Speedway Circuit. The all new Modenas CT115S comes equipped with an 114.8cc single cylindered 4-stroke SOHC engine that produces 6.6kW power output at 9500rpm and with a pulling force of 8.1Nm at 5000rpm. This gives us a basic understanding of where the bike will be positioned in the moped segment; it will be sitting in the mid-category of the available moped machine classes available here in Malaysia and that means competing straight on with Yamaha Lagenda and the Honda Dash from both of the Japanese giants. The bike will be utilizing a monoshock absorber which described by Modenas as proud feature to the bike. With a curb weight of around 99kg and a fuel tank capacity of 4.8liters the CT115S surely fit into your normal expectation of what a moped of it’s class should be. So now here we are; the first impression by just looking at the bike when it was launched. The looks was indecisively positive in a way but there is also a slight “sigh” deep in our heart after how easy it is to associate the design with the Yamaha LC looks. Not that it’s really a major downside but then again it could have been their chance to speak up and be unique in trying to capture the market attention. If you were to line it up against all the other competitors and some other random bike in a motorcycle parking space; we truly doubt that you’ll look at it twice because for us it doesn’t have that strong shout from the way it looks. But we don’t want to be too critical on how Modenas presents it’s product here, because after all; they’ve been decided through a market research and survey so YOU as a consumer should be able to accept it. When it comes to the opportunity given by Modenas to test out the machine on the circuit of Elite Speedway situated in USJ. We cannot stress out how important it was to test the bike’s handling and how it delivers the power from it’s small engine develop in conjunction with Kawasaki. 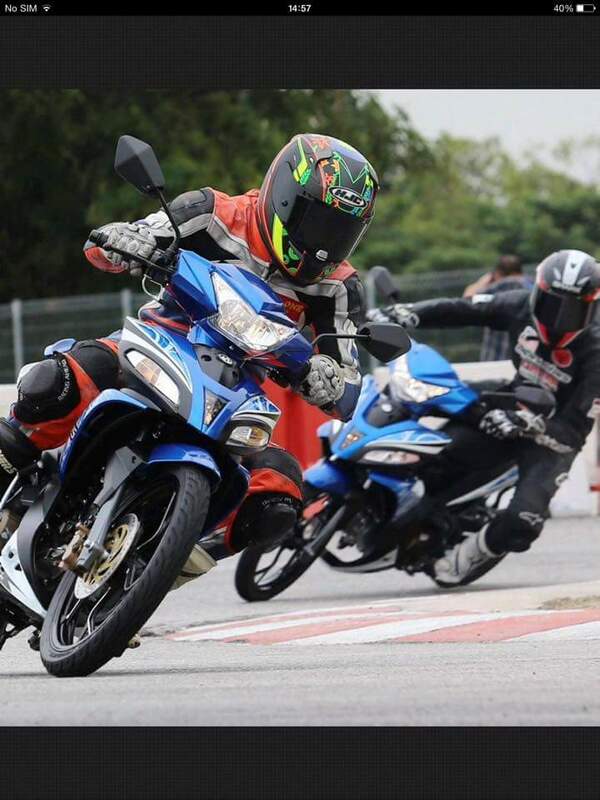 Our test riders Muhammad Rashidi and Reffy Kamar suited up and straight away got themselves into a “testing mode” on the circuit they both very familiar with. This helps with the test as it reduce the needs of our riders to learn about the circuit and learn about the bike more instead. The first impression coming from both of our test riders stated that the ergonomic of the bike fits nicely with their body size of an average 170cm tall and 60kg weight. Once they got to move, the engine delivers a smooth and consistent power to the real wheel with the help of a very natural yet responsive throttle from the machine. It was a pretty much unexpected early assessment of the RM5,330(NSP+GST) bike and thus they continue by gradually increasing the intensity of the riding. Being Malaysian Riders, our baseline of testing comes in the form of racing derived techniques and assessment for the sake of pushing the bike to a certain degree of limit and extreme testing. Both Reffy and Rashidi had their mind to test out the machine’s capability in their own range of capabilities to see if the handling or the bike’s reaction falls as a good bike or not. After a somewhat great performance from the engine, then it is time to upshift into the following gears (4 gears) with its centrifugal clutch system or in other word, your ordinary moped gear system. The transition from one gear to another works well and was easy to engage. This probably due to the fact that the bike comes straight from the factory and in a brand new prime condition; we tried to push it into a extreme usage in the span of more than 20 laps (by interval) and concluded that the gearbox performs well. This helps the bike to deliver its power in a smooth manner and thus keeping the ration between gear in a natural state without the need to overpower in each gear before upshifting. Riding it on the circuit of Elite Speedway is a great test for the whole standard setup of the bike in terms of handling and it sure was the most exciting part of the testing for our test riders. 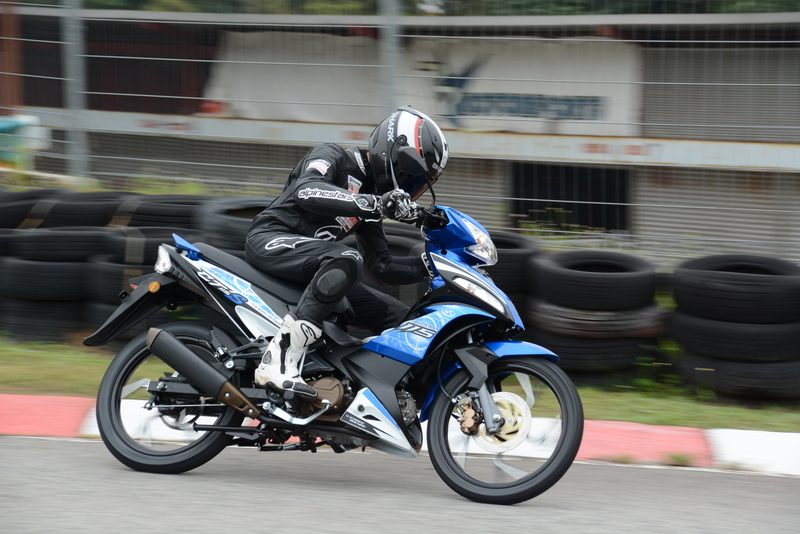 Every lap on the circuit was consistent and gradually increased in confident to both of our test riders. The monoshock proves to be a big factor to the bikes handling on the bumpy circuit of Elite Speedway. The agility of the machine was not an issue as the lightweight machine and the nature of the bike’s geometry works perfectly as expected from a moped of it’s size. Turning with the bike felt stable and the chassis plays a vital role to that. Its amazing to see what Modenas are capable of in terms of producing their product and it seldom got into the conversation among consumers due to their lack of appearance in the perspective of our local motorcyclist. Continuing with a generous amount of testing by both of our test riders; the CT115S proves to be a worthy contention in the segment of 120cc below moped machine. But it’s not really perfect in all kind of ways. There was an issue of it’s tire, sure the FKR brand was used not for it’s performance but more for it’s economic value. We can’t help but to point out the one major let down of the machine was the tire specification. The front tire sized at 70/90 on 17” wheel with the rear tire at 80/90 on 17” wheel surely doesn’t compliment the CT115S’s handling performance. We knew it wasn’t meant to be tested on the track and certainly not to the extreme that our test riders were pushing; but it should at least compliment the standard of the bike’s handling nature a little bit better since there are plenty of other options out there for Modenas to choose. But then again, this issue is simple to be rectified for those who’re going to own the bike by switching to a better model of tire. Apart from the tire, there is one little issue that we’re concern with; and it’s the quality of the built and the parts they are using for the CT115S. We didn’t crash while testing the bike and there was no parts failure during our testing; but it doesn’t look like the bike have that fine built quality that you might want to see. Some of the joints on the cover set look a little bit poorly or cheaply done. Other than that, there was no major issue with the bike. Image taken and credited to an acquaintence of Reffy Kamar. By compiling all the feedback that we got from our riders opinion, we can see that the Modenas CT115S is actually a pretty decent machine to be considered if you’re looking at owning such moped in the class. But we’re not sure if that will be enough for Modenas to turn things around for themselves with this machine. It’s a pretty competitive market they are playing with and the pricing of the bike will not be the decisive factor for the bike to be chosen on top of the other option in the market. But what we can tell is that, there is a bright future for the machine if they can get more people to try and sample it in a certain course or condition around Malaysia. Us in the motoring industry were lucky to be given the chance in testing out the bike and we now know that it is a pretty great bike after considering the basic of riding needs for a mere mortal like us. We can see that it will be a bike to commute in a short distance purpose and can be very pleasing for the money you’re investing with it. We would like to see more Modenas on the street and the last time we spoke about Modenas was with the ACE 115 and that doesn’t do so well. All in all, we felt that the bike is great and have the potential to be another model worth to be considered in the segment that it’s in. We’ll be needing to do a more thorough test with the CT115S on the road and in a slightly longer term of testing so that we can further understand how the bike fare in the real world environment out there. 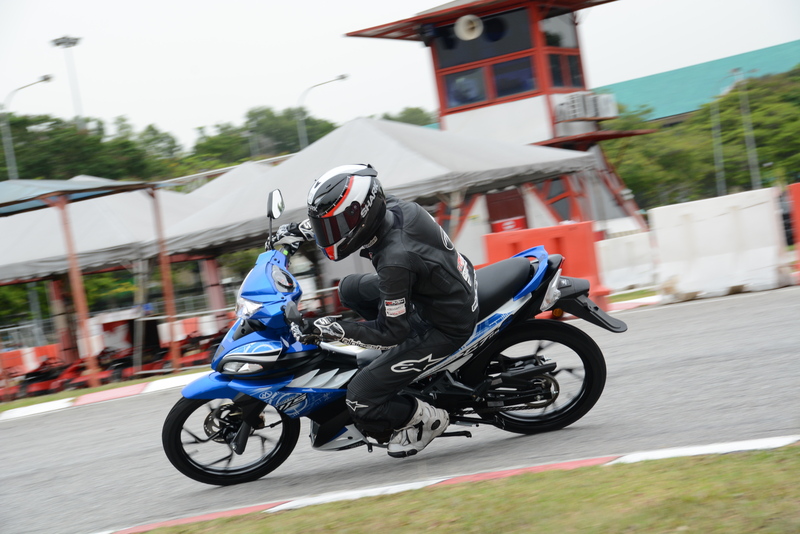 Our verdict, the Modenas CT115S worth the time to be tested and experienced if you’re looking to buy something from this segment, you may be critical in making your decision but it is fair to say that Modenas has a lot to do in order for them to regain consumer’s confident with their brand. It is true that we need to support our local product but we believe in a positive and honest critics so that they can avoid making the same mistake and get their act together to set for a more solid future. 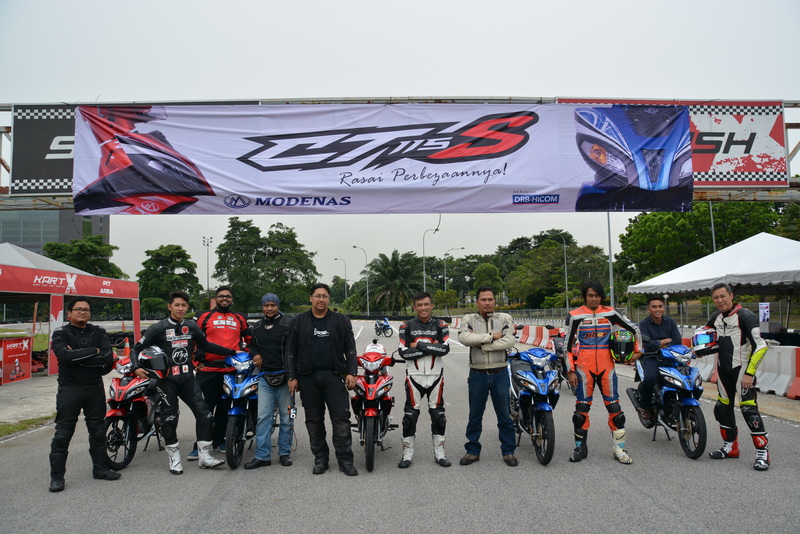 Please do stay tune with us on FACEBOOK and watch our film contents on YOUTUBE for more of Malaysian Riders.